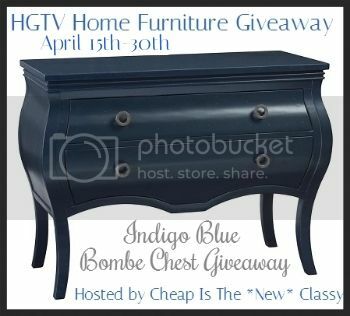 Cheap Is The *New* Classy and approximately 30 other bloggers are giving away a beautiful Indigo Blue Bombe Chest in the winner’s choice of 1 of 4 colors from HGTV Home Furniture! This would look divine in practically every living room or bedroom. I’d love to place this in my room to store photos or school work! This giveaway is set to end April 30th 11:59PM EST. Fingers crossed! Love this piece of furniture! I would pick watery. Love it! I like the Watery colorway.